Few linemen in the history of the NFL blasted open running lanes the way Walt Kiesling did. He was the big, burly man up front, the one leading the charge when Ernie Nevers became a star with the Duluth Eskimos—and when Nevers scored his record 40 points in Chicago. In fact, during an illustrious five-year career, the blocker Nevers often followed through the enemy line was “Big Kies,” a six foot two, 245-pound legend. After the Eskimos folded Kiesling played for the 1928 Pottsville Maroons. 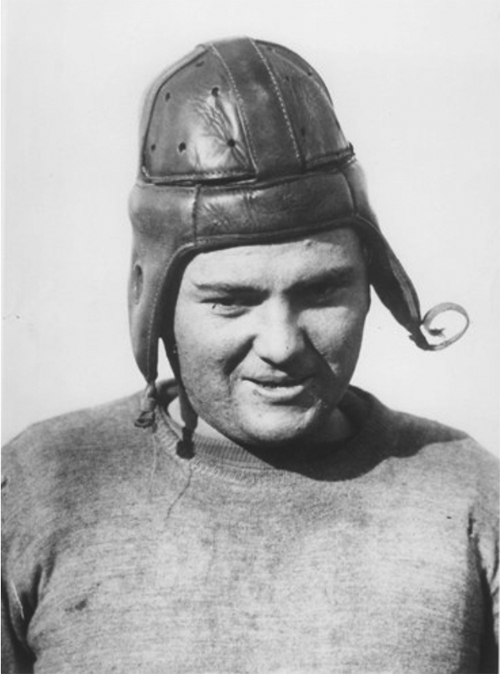 He then played five seasons for the Chicago Cardinals, earning All-Pro honors in 1929, 1930, and 1932. In 1934 he played with the undefeated Chicago Bears team, one of the best ever in the National Football League. Unfortunately, that team lost the championship to the New York Giants. Kiesling, injured, did not play. The St. Paul native who snubbed Notre Dame for his hometown College of St. Thomas, went to Green Bay in 1935 and in 1936 won an NFL championship with the Packers. The following season, when Blood McNally went to Pittsburgh as a player-coach for the Pirates, Kiesling went along as an assistant coach. The position launched an unusual twenty-year coaching career for Kiesling. He took over as head coach of the Pirates in 1939 when, according to the Hall of Fame, the always-unpredictable Blood McNally “literally walked off the job.” Kiesling continued as coach the following season when Pittsburgh changed its name to the Steelers. In 1941, Steelers’ new president Bert Bell made himself head coach. He couldn’t win a game, nor could his replacement. Kiesling was back at the helm for the final four games and stayed there—the team’s only win coming under Kiesling in the season’s final game. In 1943, with their roster depleted due to the war effort, the Steelers merged with the Philadelphia Eagles. The “Steagles,” led by co-coaches Kiesling and Earl “Greasy” Neale, finished the 1943 season 5-4-1—just one game out of first place. The following year Pittsburgh merged with the Chicago Cardinals, but with disastrous results. Led by co-coaches Kiesling and Phil Handler, the team lost all ten of its games.